“City of Light” is more than a biography of La Reynie’s career. Court life and the machinations of Louis XIV’s many mistresses are lavishly described. Juicy court gossip and the tangled love lives of royalty and hangers-on against the backdrop of an expanding Versailles is fascinating. Equally riveting are the stranger-than-fiction details of the underbelly of early-modern Paris. The very large cast of characters will come together as La Reynie teases a thread that unravels a scandal of enormous proportion, spanning years and all levels of society. 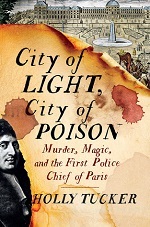 “City of Light” gives the reader a sense of Paris as it was evolving into a refined capital city, how women both high and low made their way in the that world, and the changing process of criminal justice. This book will satisfy true-crime fans, history buffs, francophiles, and lovers of historical fiction. Tucker shares her research process in an epilogue. An extensive bibliography, endnotes, a detailed chronology, and illustrations are included. This entry was posted on March 25, 2017, in Book Review and tagged non-fiction. Bookmark the permalink.